Don't have time to keep your website up to date? Not confident editing HTML directly? Not used to using PhotoShop? Need to integrate your email marketing sign-up form into your website? Need help with social media? We can help! Contact us today. Need to generate more business from your existing clients and contacts? Why not let JanesWeb create an eye-catching email template you can use to generate more business. Need help managing your sales and purchase invoices? Why not let us get your accounts in order so you can concentrate on your business. JanesWeb recommends the beuatifully simple and easy to use cloud accounting software Xero. JanesWeb Business Services, based in Wantage in South Oxfordshire, has been working with individuals, sole traders, charities and small businesses to build and maintain their online presence since 2006. New for 2014 is the introduction of bookkeeping services for sole traders and small businesses focusing on cloud accounting with Xero. JanesWeb Business Services is a Certified Xero Partner. Please call or get in touch via the contact page for further details. No minimum contract fees apply. 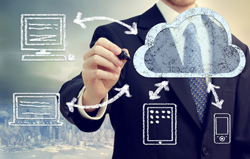 Cloud accounting: the only way is up? What is the cloud? The cloud is where you put all your data, all your files and even your software so you can access it all from any computer or device, anywhere, anytime. Is my data secure in the cloud? Your data is much safer in the cloud than on your computer as cloud companies spend vast sums of money ensuring the security and integrity of your data. Check out Xero's website to get to grips with cloud computing.